Offering you a complete choice of products which include knee brace with hinges, knee cap, donjoy knee brace 4titude, knee support brace, elastic knee support and back cryo cuff. Features-The neoprene fabric that allows improved air flow, is designed for mild to moderate medial and lateral controls. It allows 180 degree movement and prevents hyper extension of the knee. This fabric provides excellent compression and support yet allows breath ability. It is ideal for patients who wants the support for the knee due to pressure on knee. The hinge on both sides provides excellent support to knee to reduce the pain & faster relief then regular knee caps. Its patella donut in front is to provide stability to the patella. Its anatomically shaped with a "reduce compression spot" to ensure no patellar pressure. Its 3 dimensional knitting provides snug fitting and strong compression. Its bi-layered construction and dermophollic cotton inside ensures all weather comfort. Its nylon outside ensures long life, excellent aesthetics and color. Its thick knit retains therapeutic warmth and provides excellent support. Donjoy 4Titude CI Std Ligament Knee Brace For Left Right Leg is lightweight brace that provides durable support for mild to severe ligament instability. 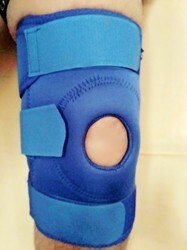 It is a low profile prefabricated ligament brace. 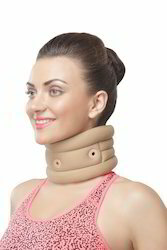 It is an off-the-shelf functional brace with standard length of 16 inches. It is ideal for moderate to severe ACL and/or PCL, ACL/ PCL combined instabilities (CI), MCL and LCL instabilities for active, sedentary and adolescent patients. The brace is ideal for non contact sports. 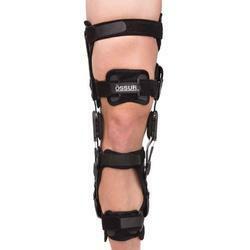 Neoprene made Knee Support Brace with Hinges gives the support to knee on both Medial & Lateral part of Knee. Its hinges are made of alloy which makes the hinge very solid and extremely light weighted. Hinges gives an optimum support to patients to reduce knee pains. Its blue colour gives a product sporty look. 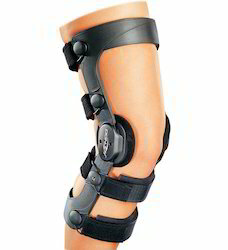 Our knee brace can be worn for a daily use by house wife to athletes engaged in sports. It also makes very useful for daily walking & jogging. Its bi-layered construction and dermophillic cotton inside ensures all weather comfort. Its nylon outside ensures long life, excellent aesthetics and color. Its 4 way stretchable knit and with 'Spandex' provides effective compression and comfortable fit. The team of our company offers Back / Hip / Rib Cryo / Cuff to the clients. It is used to minimize swelling, pain and hematoma and can be worn on the back, rib or hip area. 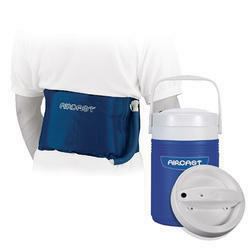 This cuff is available with an external cooler that is detachable and it controls the risk of tissue damage. Additionally, it is available in universal size only that can be availed at the normal price. It is made up of breathable three layered puff fused fabric with excellent aesthetic comfort and long life. Its reverse buckle mechanism provides strong grip and comfortable compression. The eva pad provides relief at muscle insertion. It Has A Soft Polyurethane Foam, Hypo Allergic Cotton Stockinet And A Long Hook & Loop Velcro That Provides Comfort Compliance And A Snug Fit. Rebound® PCL is a dynamic brace which is prescribed by the healthcare practitioner after Posterior Cruciate Ligament injury. ... Insufficient healing afterPCL injury can lead to significant pathologies such as chronic knee pain, chronic instability and disability or knee osteoarthritis.